Colo-X recently spent the afternoon with NTT who proudly showed us around the fleet of ever impressive Gyron data centres in Hemel Hempstead. We very much liked the combination of a full service colocation provider combined with high quality yet low-cost Gyron data centres. We expect NTT to be particularly strong for enterprise colocation, especially as they establish more of an identity in the London colocation market. It feels a bit strange these days not being able to buy a single rack from Gyron when only a few years ago they were very much looking for individual rack clients whilst they operated in LHC – the London Hosting Centre and then from 2009 in their first self-built Hemel Hempstead data centre, the 3MW Centro. Their second site Maylands, offering 8MW of customer power across 6 data halls, opened in 2012 and was driven by demand from key Gyron clients such as Spotify. In June 2012 Gyron was then acquired by NTT Communications before quickly launching a new 6MW data centre on the Slough Trading Estate, thus enabling Gyron to offer a dual site solution between Hemel Hempstead and Slough. Further customer wins included Salesforce. 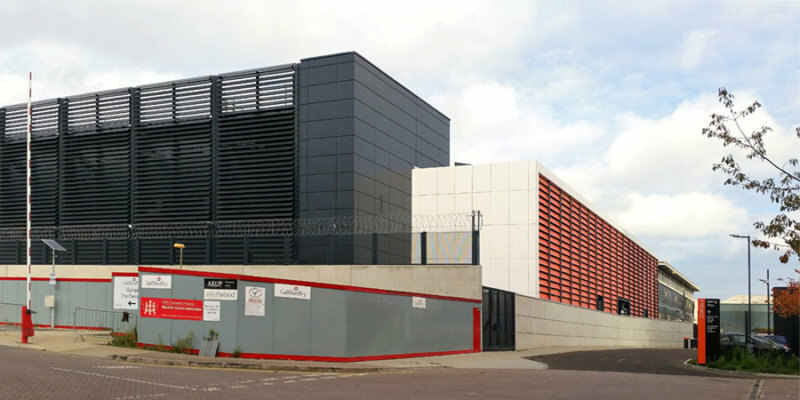 The first phase of Hemel 3, Gyron’s third Hemel Hempstead data centre is just opening (November 2016) with the total site offering 20MW of customer power, half of which is in each of the two phases. Phase 2 is already undergoing rapid fit-out, with Gyron being amongst the winners of this year’s spectacular burst of demand from the global hyper-scale cloud platforms for the London market, which we estimate has accounted for some 40MW of demand so far this year for the UK market. Hemel 2 and 3 are particularly impressive data centres, using a “flooded room” concept for cooling within each data hall, chimney racks for hot air return plenum and a dazzling clean white look which makes for good overall impressions, whilst an ultra-low PUE makes for an attractive cost base. Both dedicated, secure caged areas are possible within the suites that NTT operate in or individual cabinets, even 1/3 cabinets for smaller clients. While now majority-owned by NTT, we feel keeping the Gyron brand keeps the connection with the local market where Gyron was founded and definitely gives the data centre facilities a more welcoming look and feel, in contrast to the numerous battleship grey behemoths appearing in the London data centre market. So, what can NTT do? Offer retail sized colocation solutions in the Gyron Hemel and Slough data centres. Actually though they can do a lot more – if clients want. So colo only is one option, meaning racks, power, basic remote hands and network – either from NTT or the reasonable list of onsite carriers (eg in Hemel 2/Maylands BT, Colt, Gyron, NTT, Vodafone, Interoute and Zayo are available), in cabinets from 3kW up to 20kW. There are also some flexible/customer friendly charging options, like remote hands in 15 minute increments or metered power for customers in cages or taking 5 racks or more. While this level of support really wont interest more self-sufficient wholesale service providers we believe it will appeal to enterprise based customers seeking top quality facilities backed up by first class on site support. The final feature to support enterprise clients is easy and direct access to key hyper-scale cloud providers and NTT have this covered through their Enterprise Cloud Platform, which basically offers secure and direct private connectivity to both Azure and AWS platforms. There is also a Cloud Management Platform that allows users to both integrate these workloads into a single portal as well as provide detailed reporting. All in all we were pretty impressed with the combination of high quality yet very cost-effective Gyron data centres combined with the service and support wrap NTT can offer. This is a rare combination of a what is now a wholesale service provider (Gyron) successfully repackaging their wholesale capacity into a well thought out retail focussed solution that wont cost the earth. Contact Colo-X if you’d like to know more or to confirm pricing.